I've been fairly obsessed with Maya Brenner for quite some time. 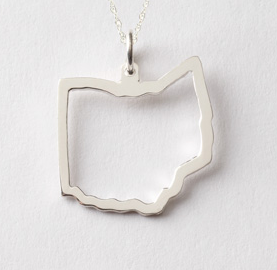 I especially love her state charms -- what better way to express your love for where you come from than wearing it around your neck? I recently splurged on the Ohio charm in sterling silver, complete with a diamond chip where Cleveland is (Cleveland rocks!) -- and I absolutely love it. And guess what? One lucky winner has the chance to win a Maya Brenner State Charm Without Chain in Sterling Silver today! This giveaway has a retail value of $80. Here's how to enter. 2) Like The Beauty of Life on Facebook and leave a comment on the Facebook post about this giveaway telling me why you want to win this Maya Brenner charm. Hands down the New Jersey charm! Massachusetts! Love these charms -- they are amazing! If Hawaii is an option, I'd do that… otherwise, Kansas. Where I grew up and where I am now. I want the Pennsylvania charm. OH-HI-O!!! :) Go Buckeye state! I would LOVE New Jersey! New York or Pennsylvania...I cannot decide! I from CO but it's a square, so im not sure what i'd pick. New York or Georgia. I would love LOVE love a California state charm! I've been wanting one for years. i have been DYING for the TEXAS charm!!!! love MB! I would love the New York charm! New Jersey! This is awesome! This is such a novel form of jewelry. I'd love to show off OHIO! Florida! Thanks for the chance! I'd love to have North Carolina in Silver. I would love to win the New York State charm! Definitely good ol' New Jersey! I would choose Tennessee. Thank you so much for the chance to win such a lovely and generous giveaway. Ohio! So glad you featured it. :) Also the Saide Necklace is gorgeous. ohhh, would it be NY or CA? You can take the girl out of California (sob), but you can't take California out of the girl! Such an amazing giveaway! Thanks so much for hosting it! I heard about it on Twitter :) I'd pick California, the state where I was born and raised. It will always be close to my heart. I've been dying to have such an darling charm from Maya Brenner! annamaxw@gmail.com is hurtin' for a north carolina charm! Maya is an amazing spirit! It would be nice to honor my state of Connecticut for many reasons.